Really! Will Ferrell showed up on Conan Wednesday night in full Ron Burgundy gear — complete with mustache, jazz flute, and insults — and made it very clear: “I want to announce this to everyone here in the Americas … to our friends in Spain, Turkey, and the U.K., including England … that as of 0900 Mountain Time, Paramount Pictures and myself, Ronald Joseph Aaron Burgundy, have come to terms on a sequel to Anchorman … it is official: There will be a sequel to Anchorman.” Burgundy also tweeted, “Hey America & Hawaii. Looks like Paramount & my lawyer Gene Tigerworthy have agreed to terms on a sequel to Anchorman. Whiskey sours on me!” Well, I don’t know about you, but to me, this news smells exactly like the opposite of a used diaper filled with Indian food. 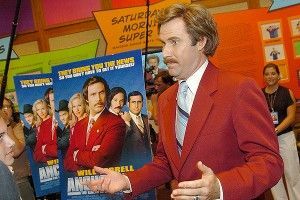 Deadline reports that, just as you could have assumed, Judd Apatow will be back to produce, Adam McKay will be back to co-write and direct, and Steve Carell, Paul Rudd, and David Koechner will — despite their manifold post-Anchorman successes (well, maybe David Koechner’s post-Anchorman successes aren’t exactly “manifold.” Sorry, David Koechner, that isn’t to say you’re not fantastic. Just pointing out relative differences in you, Rudd, and Carell’s career arcs), will be back on the Action4 news team. An insider says that the team is “kicking around ideas” for no. 2 and that “We didn’t expect a week ago that this thing was going to get greenlit. It’s been alive and dead so many times.” It’s true: It feels like every few years, rumors of this project’s existence have crept out. (One of its most auspicious iterations was as a musical, one that would premiere on Broadway before hitting the big screen).